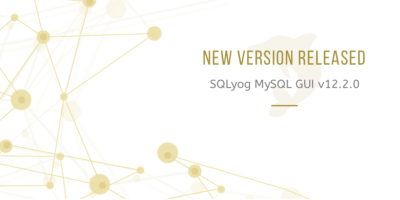 With the SQLyog MySQL GUI 12.2.0 release, we have fixed the sluggishness when moving around the data GRID and a few others that ..
With the SQLyog MySQL GUI 12.19 release, we have added a range of features that include virtual columns support for MySQL, estab..
Bug Fixes: * In 12.17 (released yesterday) it could happen that session restore erroneously could restore (a) Query tab(s) fr..
Changes as compared to 12.16 include: Bug Fixes: * Fixed a memory leak as well as a crash in ‘session restore’ when writin..
Changes as compared to 12.15 include: Features: * Schema Designer may now optionally use ‘portrait’ or ‘landscape’ layout ..
Changes as compared to 12.14 include: Features: * The search for the connections and databases is now faster and simpler, ..
Changes as compared to 12.13 include: Features: * Added an option in “Export as SQL Dump”, “Export Table Data As..” and “S..
Changes as compared to SQLyog MySQL GUI 12.12 include: Bug fixes: * Due to use of an old Plink version in older versions ..
Changes as compared to 12.11 include: Features: * XML files can now be imported from GUI controls in table menu/context menu .. Important notes: . * This release requires that user re-enters his registration key. Please have it available when upgrading. T..